Rohingya refugees continue to arrive in Bangladesh with stories of continued oppression by Myanmar’s security forces. 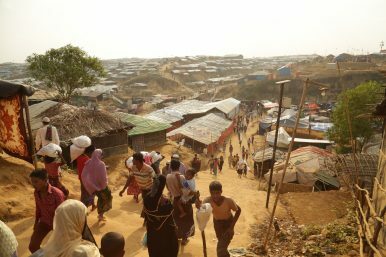 The situation for the Rohingyas has further deteriorated following recent fighting between an ethnic Rakhine insurgent group – known as the Arakan Army (AA) – and Myanmar security forces. Bizarrely, the military is conducting a “clearance operation” against the AA and publicly is linking the AA with Rohingya insurgents. This despite widespread anti-Rohingya sentiment among the ethnic Rakhine who make up the Arakan Army. The impact on the Rohingyas is twofold. First, as one new arrival described to us, security forces are now accusing Rohingyas of harboring AA members in their villages and using this rationale as another pretense to harass and abuse villagers. Second, since mid-January 2019, the government has blocked access to rural areas of northern Rakhine to all but two international aid organizations, even in areas where there is no conflict. This leaves Rohingyas who have been dependent on humanitarian assistance in an even-more desperate situation. Finally, Myanmar has done nothing to improve the situation for the more than 120,000 Rohingyas and other Muslims who have been displaced internally since 2012. They have been confined to camps for years, though these displacement sites are more open-air prison than camp. The government is moving ahead with a plan to close the camps that involves building new “villages” near the current camps while likely maintaining the same restrictions on freedom of movement. This represents a concerning indication of how Rohingyas in Bangladesh would be treated if they returned to Myanmar. Furthermore, the Myanmar government has also done nothing to improve the underlying and systematic mistreatment of the Rohingya population. Therefore, international pressure on Myanmar’s leadership remains vital. This should include additional targeted sanctions on the leadership of Myanmar’s military, including military-owned companies, as well as support for evidence collection and accountability mechanisms, including referral to the International Criminal Court. A spotlight must be maintained on the situation in Rakhine. There is no more time to wait and see if basic conditions will improve. If nothing changes, the potential for the return of Rohingya refugees to their homes in a safe, voluntary, and dignified manner becomes less likely by the day. Mark Yarnell is a senior advocate and UN liaison and Daniel Sullivan is the senior advocate for human rights at Refugees International. They traveled to Bangladesh to interview newly displaced Rohingya refugees about conditions inside Myanmar in February 2019.